A former pro skateboarder turned film maker, Greg Hunt has been responsible for delivering some of skateboarding’s seminal works of the past decade (Sight Unseen, The DC Video and Alien Workshop’s Mind Field). He first picked up a skateboard when he was 12 years old and has been fully immersed in the skate culture since. The list of skate celluloid sweetness Hunt has been a part of over the years includes The DC Video, Alien Workshop's Mind Field, Sight Unseen and Dylan. In addition to the skate films, he has also created music videos for pro skater and musician Tommy Guerrero, Jet Black Crayon and M83. If you areinterested in reviewing all the projects Hunt has been a part of over the year should log onto his website. It is jam packed with video clips, old interviews, archival photos and enough gnarliness to keep skate fans entertained for hours. Some favorites are his black and white photo of skater Dylan Reider. The Dylan photo consists of two images of the skater blended together; the final result of which is eerie. It was in the mid nineteen nineties when, as professional skateboarder himself, Greg picked up his first camera, a still camera, and began to explore documenting his life and his friends’ lives within their surroundings, in the streets and on the road. Selective Memory encompasses sixteen years, combining over 150 still images with unseen archival film and video to offer a true inside glimpse of this particular outsider world. 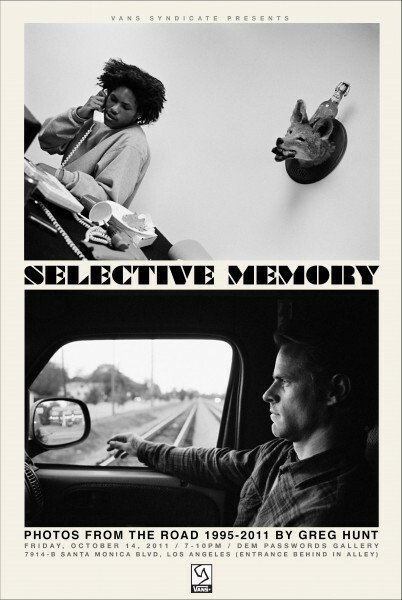 Those images will serve as an exhibit with Vans Syndicate called Selective Memory, the first solo exhibition from renowned skateboard filmmaker and photographer Greg Hunt.